Comparing it to a planet isn't enough? Comparing it to Infinity or a CAS just makes it really, really big. Comparing it to a planet makes it gargantuan, which is what it is. Do people understand how big a planet is? You do a comparison against something known to the audience. Sizing the Didact up against chief works because we know/relate to something 7 feet tall. 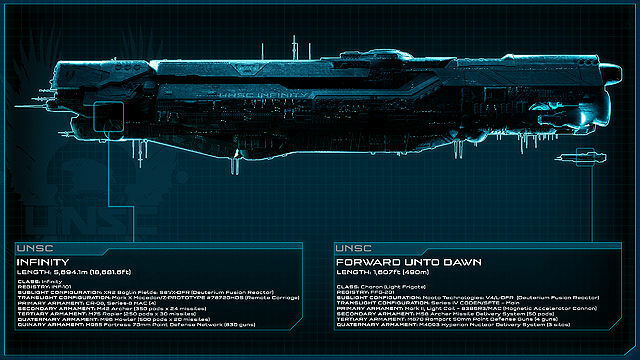 Comparing The Didact's size with an Airplane or boat would be the next best,but may suffer the same issue. Comparing Mantle's Approach to the Infinity or a CAS would be like comparing a PT Boat to a Battleship. You'd need at least for CSOs, the biggest ships from the Human-Covenant War to make even a decent comparison. And yes, I would assume that most people have a good idea of how big a planet is. So, the planet itself really is the best comparisom that can be made. If you can see the planet curving underneath something that hasn't really left it yet, it is massive. That's what the scene of Mantle's Approach leaving Requiem can show. Stephen Loftus did the size work thing. He helped them on the guide. Using the curvature of the planet he got that size. 1. People know how big Those ships are so if TMA is set nex to one we can better understand how large the ship is. Which is my point. 2. 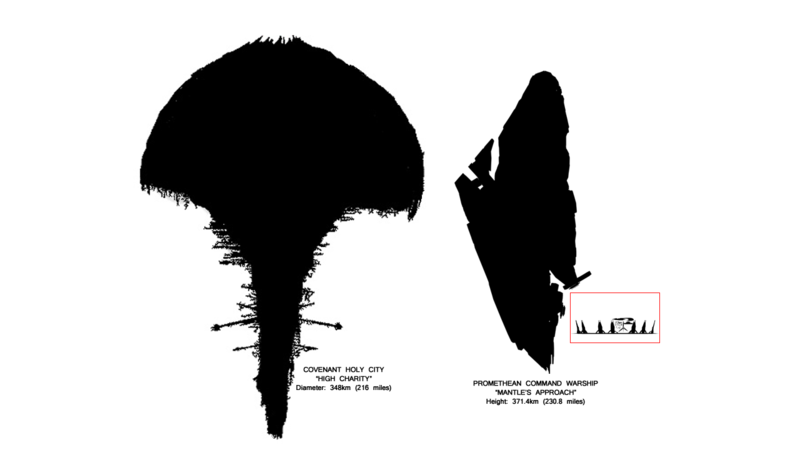 Which people still can't understand size wise and still needed to be compared to Anchor 9 and Frigates. 3. They don't. Nobody understands how big requiem is. Nothing in the game establish that and the average fan won't know. I don't even know. Which is why scaling a ship to a planet doesn't help. Halopedian states the ship is about 88 miles long. Not a single person was able to roughly estimate how large the ship was just from comparing it to requiem. It's (roughly) the size of the lone star state (Texas). Well, in height anyways. Damn. What we see there is something really big compared to something really small. What that does is tell you that Infinity is really big. People don't know starship specifications. See those specs up in the corner? Infinity is in there. There is no comparison. Something tiny to something gargantuan. You act like more people would know that Infinity is precisely 3.5 miles long than people would know that planets are massive. People know planets are big. Enormous. So, here's a planet and Mantle's Approach. Planets are big. Mantle's Approach is not only extremely visible from this far above the planet, but it's not even fully out yet. It's "touching" the outer layer and is extending far above that. That, let's you know that Mantle's Approach is enormous. People may know that Infinity is relatively big. But comparing Infinity to MA wouldn't really work because you can't even see Infinity next to it. That's why you need something bigger. A CSO would generally work, as long as people know that thing is several times larger than something like Infinity, but otherwise, there is nothing that we can compare it to other than High Charity. That's where you go to the biggest thing, a planet. If you can see Mantle's Approach next to a planet... that really shows how big it is. I can't find where he explains how he calculated the Mantle's Approach size but I remember. Using Requiem I think. That's how it is, that's the size. That is canon. Actually Ericky, you've got it backwards. 343i used in game renders of Mantle's Approach to determine how big it is. Stephen Loftus went over the pages of info and calculations 343i did to determine the Mantle's Approach's size and thought it was correct. So he used Photoshop on that part of the cutscene to create an alternate image, one of the full planet with the full Mantle's Approach superimposed over it to calculate the size of Requiem. 343i agreed with that size. Right, but be did use the curvature thingy then right? I tried searching for it but couldn't find it. All close and true enough? Looking back, the Broadsword is a fast little guy, seeing as how it covered miles and miles and miles and miles within a few short minutes. The broadsword accelerated A LOT and went very fast to catch up with the Mantle's approach. It went slower while on the trench run. Query Answer: Promethean Command Warship, designation Mantle's Approach. Preliminary analysis confirms that [UNSC Navy Threat Database] records [ref: Halo 4 Visual Guide, p. 193] reflect last known configuration of Mantle's Approach in local reference dimensions. Interesting. The design seed for Mantle's Approach was "illegal", but it was Faber who authorized it? Too bad we blew it up. Hi, Loftus here. I just stumbled on the topic, but I can add my 2 cents here. As Onyx81 added, erickyboo's explanation is reversed. The Mantle's Approach size was initially determined by 343 Industries when we began the review process for the Visual Guide. In fact one of my first tasks on the book before I got a copy to review was to take a couple of images about Mantle's Approach and verify the numbers provided. The size was determined in the following manner: The Broadsword's final fight against the AA guns in the main weapon area of the ship was built at the size of the Broadsword, so the fighter and environment were scaled to one another. Next, that area was scaled against the same weapon area of the Mantle's Approach model (which was never rendered in its true full size in the game like many large objects in Halo), and the final dimensions of the Mantle's Approach was determined from there. The reversal of what was said in your post, is that once I had independently confirmed 343 Industries' size for the Mantle's Approach, I used those values to determine the size of the planet Requiem based on the ship leaving the outer hatch. The Mantle's Approach is comparable in size to High Charity. A new scale chart of mine will be on HBO within the next few days (it's been submitted for posting already) and that will nicely show the size of the Didact's ship compared with High Charity. I hope this cleared up the original poster's question. Very insightful to tell us how you determined the numbers. I'm very glad for your hard work on those charts! It makes envisioning the actual size of things much easier! So much awesome! Thank you Catalog and Mr. Loftus! Still, thanks and, amazing work yet again on that scale chart! You posted on halopedia so I'll reply here. The heavy artillery I mentioned in thru past, it seems to differ on size. In Spartan ops. E2C1, E2C4, E6C1, E8C5 and E5C10. They seem like scaled down versions of the forerunner heavy artillery. Those seem to be missing. Also what's http://halo.bungie.org/misc/sloftus_scalecomparison/1280h.html?display=cov_m the covenant artillery? I don't recall that shape... is it supposed to be the one from Episode 8 Chapter 2? And finally, master of scale, this might be a suggestion for some future project and it's probably not your area of expertise but might as well suggest it. Ever took an interest in how strong weapons are? How much kinetic energy is transferred into a target when you shoot a gun? How much energy a LightRifle shot, Autosentry shot, or a plasma pistol shot emit upon hitting something? How much energy can an energy shield withstand before overloading? Joules, kilojoule, megajoules, that sort of thing. Or how powerful ship weapons, covenant, forerunner, human are? Kilotons, megatons, gigatons (TNT equivalents)? There sere known values, such as certain frigate MACs dealing 64 kilotons, havok nukes dealing 30 megatons. Fatman's yield is estimated to have been 20-22 kilotons of TNT. An ak-47 muzzle energy is of 1.2 kilojoule or so I think. I think the assault rifle has been estimated to have a projectile muzzle velocity of 4 kilojoules. The spiker rounds have about as much kinetic energy as a tennis ball I think. Maybe it's not something on your domain but it might be interesting for a lot, and I mean a lot of people. Maybe something you could suggest to 343i to determine.